When this Manhattan investment company decided to mirror its critical data off-site, the IS staff built their own T3 and T1 routers. How did that work, and would they do it again? Port-scan your own hosts to find misconfigured and unauthorized services. Put all that data into a database, and you can keep track of thousands of systems. When projects need to share the Linux cluster but shouldn't see each other's data, split your in-demand cluster into separate virtual ones. The 2.6 kernel brings new capabilities to the Linux sound API. We cover the essentials with a working sound recording app. Don't do this. It could get you fired. Unless your company is really shooting itself in the foot, then you've got to do what you've got to do. Tweak your system to make photo colors accurate, and more. 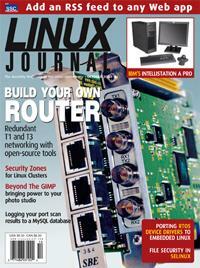 Now you won't get a nasty surprise when the photo you send to Linux Journal shows up all wrong. Your old real-time operating system made you do a lot for yourself as a driver author. Take advantage of the facilities Linux offers and clean up some spaghetti code while you're at it.